DRAIN OUT is a concentrated formulation designed to release the grease from traps, drains in restaurants and hotel industry. It is very effective in grease removal. Drain-Out is effective in blocking the production of odour occurring through natural bacterial populations. 1) For normal block drains, use 150-200 ml of this product, leave for 30 minutes and then flush with plenty of water. 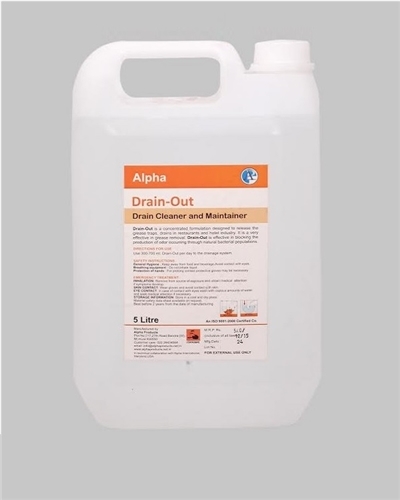 2) For heavy block drains use 500 ml of this product. Leave the product overnight and then flush with plenty of water. 3) Use 300-700 ml Drain-out per day to the drainage system. Once in 20 days use 200 ml of this product. Leave the product to act for 30 minutes and then flush away with plenty of water.